Of all things, I never thought I would catch myself thinking about fish this week. However, we are as pleased as everybody else that we have a brand new neighbour on Church Street N16 in the form of ‘Jaines and Son’ fishmonger. It is the son and his girlfriend of the Grimsby based wholesaler who have put together the lovely looking shop. 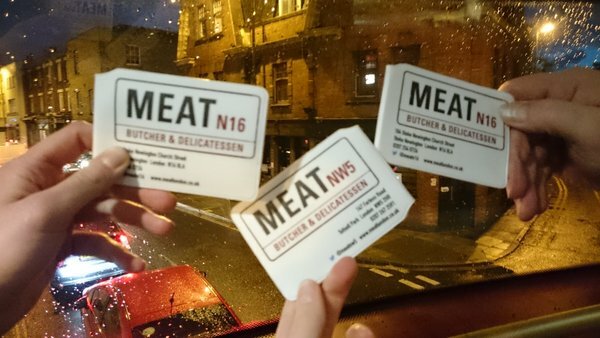 Here at Meat London we are delighted to see small independent food retailers thriving and we ‘Welcome’ a fishmonger onto the street. Attending wine tastings in London is always a great experience for us, and always packed with surprises, as was the recent one we happily had with one of our favourite suppliers, “Bancroft Wines”. 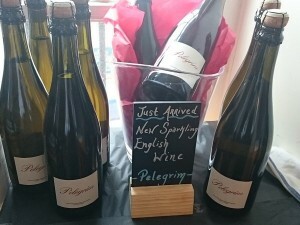 Our old friend, Jonny Patterson, soon had us tasting a beautiful English sparkling wine. It is equal proportions of Pinot Noir, Pinot Meunier and Chardonnay, plus reserves from previous vintages to give further complexity and a consistent, extra dry, non-vintage style. And it’s delicious! While we don’t want to upset our French neighbours, we note that the British were the first to see the tendency of wines from Champagne to sparkle as a desirable trait and tried to understand why it produced bubbles. Wine was often transported to England in wooden wine barrels where merchant houses would then bottle the wine for sale. During the 17th century, English glass production used coal-fuelled ovens and produced stronger, more durable glass bottles than the wood-fired French glass. The English also rediscovered the use of cork stoppers, once used by the Romans but forgotten for centuries after the fall of the Western Roman Empire. During the cold winters of the Champagne region, temperatures would drop so low that the fermentation process was prematurely halted—leaving some residual sugar and dormant yeast. When the wine was shipped to England and bottled, the fermentation process would restart when the weather warmed and the cork-stoppered wine would begin to build pressure from carbon dioxide gas. When the wine was opened, it would be bubbly. In 1662, the English scientist Christopher Merret presented a paper detailing how the presence of sugar in a wine led to it eventually sparkling, and that by adding sugar to a wine before bottling, nearly any wine could be made to sparkle. This is one of the first known accounts of understanding the process of sparkling wine and even suggests that British merchants were producing “sparkling Champagne” before the French Champenois were deliberately making it. So the first English wine that we have added to our collection is “Pelegrim”, from Westwell Wines, on the slopes of the Kentish North Downs. The name means “Pilgrim” in Middle English (12th century) and recognises the history of the ancestors that walked the Pilgrim’s Way for centuries on their final leg to Canterbury. The wine has a fine persistent bubble. It is amber in colour with fresh aromas of apples, raspberries and sourdough, and a lemon twist at the end. It is traditionally bottle-fermented and aged for at least 24 months, which gives a biscuity bouquet. Tufnell Park tube station opened again this week after nearly a year. I don’t think anyone quite understood why the station had to close completely while the lifts were refurbished or, in fact, why it took so long, but it did and now the new lifts are as ‘swanky’ as an underground lift gets. By way of celebration, we deployed Gessica and Kai to the entrance on Tuesday morning and they gave out hundreds of Meat London Oyster card holders. It was fun for us and we saw a great number of our customers going through the station on their way to work. It reminded me about our per-paid Meat London credit cards that come with card holders and gift cards. We sell them at both shops and they are a fantastic gift for all carnivores. The customer simply pops into the shop, buys the card to the value that they want and the Team will upload the value. The recipient of the gift can then shop with us until the card runs out of credit. Now, it’s not for me to gossip, but it’s amazing how many mums and dads buy them to make sure that their kids don’t die of starvation as they leave home for the first time and settle into a new home of their own.